Dear Internet, meet my newest online addiction: Fashism. Fashism can help you decide what to buy when you're out shopping. It can help you decide what to wear to a special event if you're stuck between two different outfits. It can also help you come up with accessorizing ideas once you've chosen the perfect outfit. Simply upload your photos, pose your question, and give it a few seconds. Within moments, people from all over the world will be weighing in. Fashion bloggers, I know you're thinking, "As if I need another online receptacle for my daily fashion photos!" And I understand. Between my blog, Weardrobe, Chictopia, Lucky Style Spotter, Lookbook.nu, Wardrobe_Remix, and Modepass, I feel like I'm about at my limit of sending my dailies all over the web. But Fashism is different than anything else and is definitely worth joining. 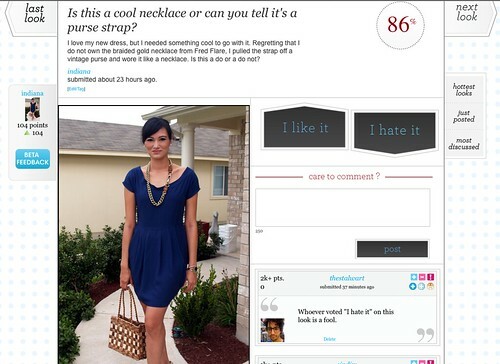 I uploaded my first photo yesterday of my purse handle necklace. I know my Adored Austin readers gave it a huge thumbs-up, but what about the rest of the world? What would they think of my last minute creation? Twenty-four hours later, I'm sitting at an 86%. Overall, it's a go! If you can take the criticism and the "I Hate It" votes with a giant grain of salt, Fashism is the place to solve your wardrobe quandaries. If you give good advice, it's also a great way to get new readers to your own little spot on the web. Founded by three former Austin residents (who have since relocated to NYC), I exchanged some emails with Brooke Moreland, one of the co-founders. 1. What inspired you to start Fashism? Basically we came up with Fashism on a whim when my husband Joe and I we were out shopping together, trying on clothes and trying to make decisions about what to buy. Somehow it just clicked that we should have a way of instantly uploading photos and getting snap responses from people on the web. In this day of Twitter and iPhones, there's no reason to just get advice from people who are around you physically. Our third co-founder Chris, who is our technical expert, also loved the idea and was eager to whip it up. 2. Why should fashion bloggers use Fashism? Fashism is a good place for bloggers to establish their expertise and insight among people who are looking for help. Whenever I get good advice on the site, I like to check out who's giving it, and learn more about them. When people comment on my looks I tend to really heed the advice of those users who's style I respect and want to emulate. Everyone can learn something from someone else! Very soon, we plan on developing deeper integration between a user's activity and their blogs, so that they can highlight what they've done on their own site. 3. 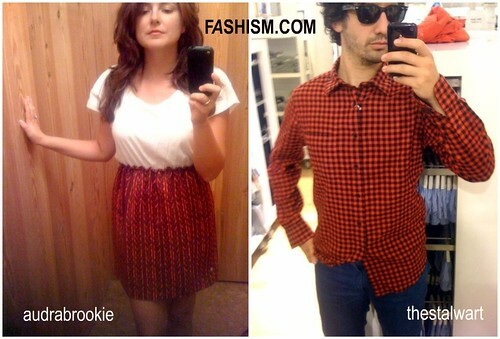 Do you and Joe [one of the other founder] upload your own photos to Fashism? Joe and I definitely upload our own photos pretty regularly. His username is thestalwart and mine is audrabrookie, and we are all over the site. It's awesome being able to use the site for the exact purpose we dreamed of. We probably upload about 3 images or so a week each. Usually when we are out in store trying to make decisions on purchases. Also if I have a special event or something I always upload and see if a) the look is appropriate for what I'm doing b) if people have ideas about how to accessorize, or what shoes to wear, etc. 4. How do you see people using Fashism, daily? As far as people using Fashism daily, I think it is definitely a site that people who are into it check every day. Even if you don't have a lot of time, it's fun to pop in, see what's new and leave a couple comments. We certainly are into people posting their outfit everyday, especially those who are already in this habit and uploading to Wardrobe Remix and their own blogs. But it's also a space for the casual user, a non fashion-obsessed person, to ask a random question or two and get some good feedback. 5. If you were given $1000 to spend on clothes, what would you buy at this very moment? Ooooh, I wish I had $1000 now to spend on clothes! Right now I would probably spend most of it on a very nice tailored wool coat. One that fits me like a glove. Winter is coming and when you are walking down the street your coat is all people see, so it's good to have a coat you feel confidant in. I like some Marc Jacob coats, and I have seen some lovely smaller name designer coats in some boutiques in New York. But honestly the best coat I ever bought was at the Family Dollar on Oltorf in Austin. It was a long trench that I wore for years. And it was only $14!!! If I can money let over I would also get some nice sleek riding boots. If I had any other money left over I would spend on some cool vintage pieces. Join the party at Fashism.com. For further reading, check out Brooke's column on Mediate. See also: The Fashism Blog. Thank you, Grace's Birdcage and Punky Style!